To figure out federal taxes, employers should have employees fill out a mandatory IRS W-4 form. This form is used to figure out federal taxes, and state and city taxes where applicable. To calculate total federal tax, use the employee's W-4, Employer's Tax Guide and Supplemental Employer's Tax Guide. Social Security tax makes up one half of FICA (Federal Insurance Contributions Act). The tax rate for Social Security during 2018 was 6.2 percent of each employee’s salary, with the employer paying a matching amount. Both the employer and employee are only responsible for a limited amount of Social Security tax. This amount is paid for anything earned up to a wage base of $128,400 for the year 2018. The other half of FICA is Medicare. Employers must withhold 1.45 percent of each employee's salary for the Medicare tax. Also, employers must pay a matching amount. 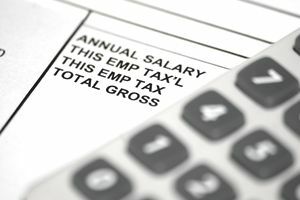 In addition to the payroll taxes listed above, employers must pay an unemployment tax for each individual that works at the company. This is called State and Federal Unemployment Taxes (SUTA and FUTA). The tax rate for FUTA is 6.0 percent, and it's applied to the first $7,000 paid in wages to each employee during the year. Employers who pay their SUTA on a timely basis receive an offset credit of up to 5.4 percent. SUTA taxes vary by state. The requirement to submit payroll taxes is enforced by a system of strict penalty assessments. Companies receive an automatic penalty from 2 percent to 10 percent for not paying federal payroll taxes properly and promptly, and state and city taxing entities assess similar penalties. A business will also receive additional penalties for not filing monthly, and quarterly payroll tax returns, and forgetting to submit a W-2 form for each new employee could cost $50 per form that wasn't filed promptly. The IRS enforces a much more severe penalty for companies that don't submit their withholding and social security tax fund payments as required. The IRS will charge a penalty of up to 100 percent of the unpaid amount to any company or individual, such as a corporate executive in charge of making sure the payments take place.